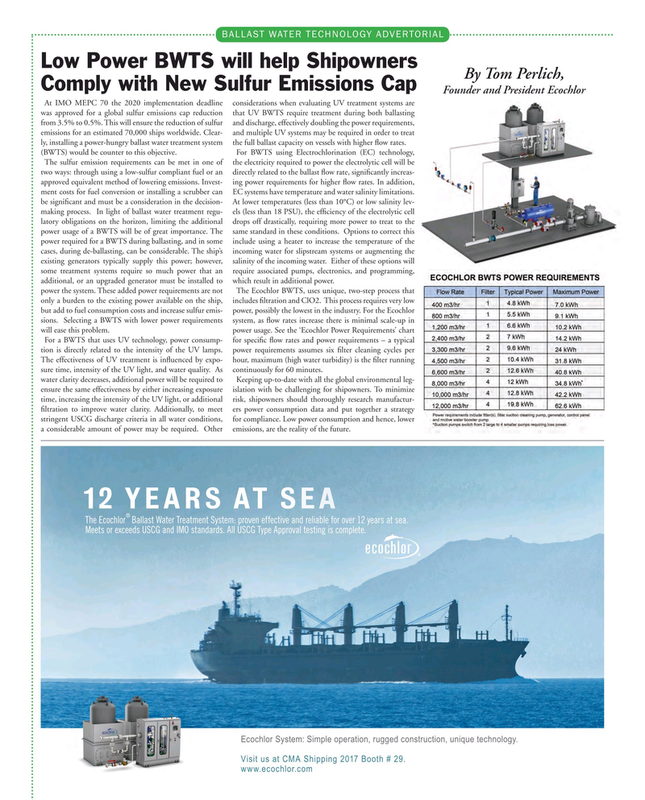 The sulfur emission requirements can be met in one of the electricity required to power the electrolytic cell will be two ways: through using a low-sulfur compliant fuel or an directly related to the ballast ? ow rate, signi? cantly increas- approved equivalent method of lowering emissions. Invest- ing power requirements for higher ? ow rates. In addition, ment costs for fuel conversion or installing a scrubber can EC systems have temperature and water salinity limitations. be signi? cant and must be a consideration in the decision- At lower temperatures (less than 10°C) or low salinity lev- making process. In light of ballast water treatment regu- els (less than 18 PSU), the ef? ciency of the electrolytic cell latory obligations on the horizon, limiting the additional drops off drastically, requiring more power to treat to the power usage of a BWTS will be of great importance. The same standard in these conditions. Options to correct this power required for a BWTS during ballasting, and in some include using a heater to increase the temperature of the cases, during de-ballasting, can be considerable. The ship’s incoming water for slipstream systems or augmenting the existing generators typically supply this power; however, salinity of the incoming water. Either of these options will some treatment systems require so much power that an require associated pumps, electronics, and programming, additional, or an upgraded generator must be installed to which result in additional power. The effectiveness of UV treatment is in? uenced by expo- hour, maximum (high water turbidity) is the ? lter running sure time, intensity of the UV light, and water quality. As continuously for 60 minutes. The Ecochlor Ballast Water Treatment System: proven effective and reliable for over 12 years at sea. Meets or exceeds USCG and IMO standards. All USCG Type Approval testing is complete. Ecochlor System: Simple operation, rugged construction, unique technology. Visit us at CMA Shipping 2017 Booth # 29.